After she received the stigmata in 2004, Judith von Halle began vividly to experience the events that occurred at the time of Christ. These continuing experiences are not visionary or clairvoyant in nature, but constitute an actual participation, involving all human senses, in the events themselves. To complement this method of witnessing Christ's life, von Halle applies a spiritual-scientific mode of observation - a form of research based on a fully conscious crossing of the spiritual threshold by the human 'I' (or self). Combining the results, she describes here, in her most powerful book to date, the secrets connected to particular events of Christ's Passion. 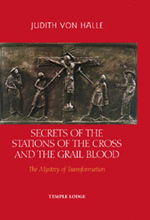 Von Halle discusses the Mystery of Golgotha in its relationship to the formation of the Resurrection Body; the Mystery of the Spear-Wound in Christ's side and the Grail Blood; and how Christ's Seven Words on the Cross relate to the Stations of the Cross.